OGP’s flexible solution for any metrology requirement, as an adaptable modular system ZIP can facilitate a number of additional sensors to suit any future metrology requirement, ensuring your inspection process is optimal through the ability to adapt your measurement technology. The full range of ZIP models excels at video measurement and advanced multi-sensor versatility maximizing performance and increasing your productivity. This system allows for the integration of sophisticated video capability, touch probe sensors, laser sensors and rotary devices that can be added as and when required, providing an efficient and cost-effective solution from the moment of installation. 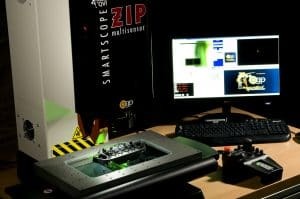 The flexibility of a SmartScope® ZIP means you can specify for today with the confidence of capability for the future. SmartScope® ZIP 250 sets a high standard in benchtop metrology. This durable system features fast stage speed for maximum throughput and short cycle times, without sacrificing accuracy. A heavy duty cast base with Y-axis center drive assures metrological stability. Like all ZIP systems, SmartScope® ZIP 250 is equipped with 7:1 AccuCentric® zoom optics and is ideal for a wide variety of manufacturing industries and locations. SmartScope® ZIP 300 is a fast, accurate floor model metrology system offering a combination of hardware performance, optical capability, and ease-of-use. Its fast DC servo motor drives propel the stage quickly, reducing cycle times. A rigid cast iron base ensures stability and metrological accuracy. SmartScope® ZIP 300 is also available with an optional 300 mm of Z-axis travel. Like all ZIP systems, SmartScope® ZIP 300 is equipped with auto-calibrating AccuCentric® 7:1 zoom lens. SmartScope® ZIP 450 is a floor model metrology system offering video and multisensor measurement for large parts. It has a reputation for extreme reliability and proven metrological performance. Traditionally strong in video measurement, it is also available with contact and non-contact probes, as well as the unique switchable TTL laser. Like all ZIP systems, SmartScope® ZIP 450 is equipped with 7:1 AccuCentric® zoom optics and is ideal for a wide variety of manufacturing industries and locations. SmartScope® ZIP 800 is a floor model metrology system offering multisensor measurement of large parts, due to its large XYZ measurement volume. Measurement stability is built-in with ZIP 800, since its granite base and bridge provide a rigid, orthagonal base for accurate measurements. Traditionally strong in video measurement, it is also available with contact and non-contact probes, including the unique switchable on-axis TTL laser, the Rainbow Probe™ scanning white light sensor, and the Feather Probe™ for micro-measurements of fine part details. Like all ZIP systems, SmartScope® ZIP 800 is equipped with 7:1 AccuCentric® zoom optics and is ideal for a wide variety of manufacturing industries and locations. 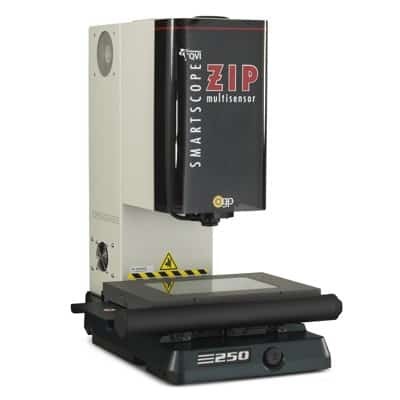 SmartScope® ZIP 800 is also available with an optional 300 mm of Z-axis travel. SmartScope® ZIP Lite 250 offers a cost-effective way of getting the benefits of automatic video-based inspection and measurement, with the inclusion of advanced ZIP motorized zoom optics. This compact system provides an XYZ measurement volume of 250x150x150 mm, with an optional 300 mm extended X-axis. SmartScope ZIP Lite 250 features joystick controlled precision mechanical bearing motorized stages and 0.5 µm linear scales mounted to a metrologically stable granite base and column. Its precise 7:1 motorized zoom lens keeps images in focus and on-axis throughout its zoom range, while a wide array of optional lens attachments and adapter tubes expand the magnification range, providing further value and versatility. LED coaxial and profile illumination combine with the patented white-LED SmartRing™ programmable ring light to provide lighting adaptable to a variety of measurement conditions. SmartScope® ZIP Lite 250 also provides multisensor touch probe or DRS™ laser support. 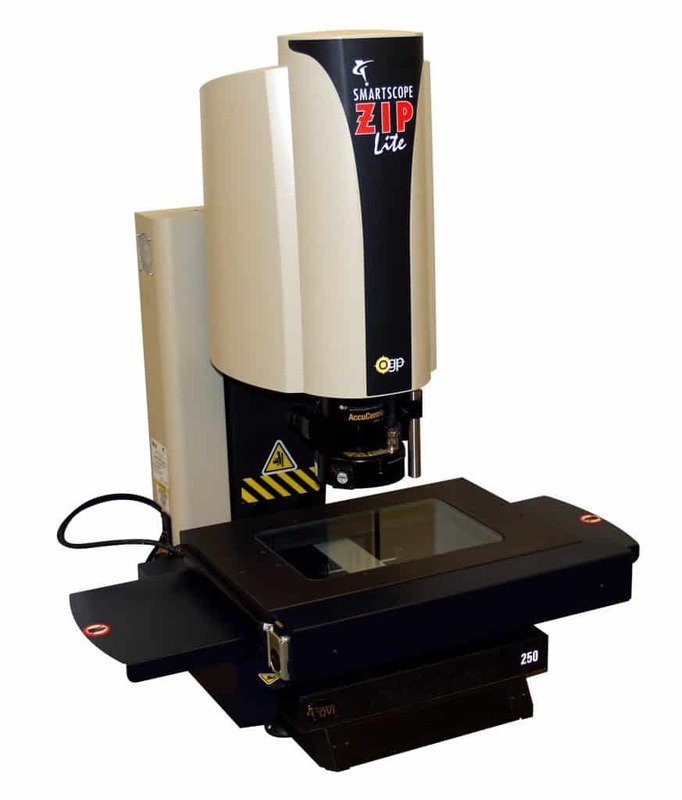 SmartScope® ZIP Lite 300 is similar to the benchtop SmartScope® SmartScope ZIP Lite 250, but with expanded XYZ measurement volume of 300x300x150 mm. 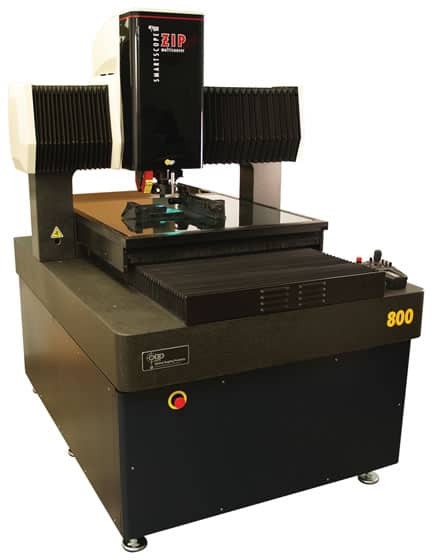 It, too, features joystick controlled precision mechanical bearing motorized stages and 0.5 µm linear scales mounted to a granite base and column, providing metrological stability and measurement precision. Its patented AccuCentric® 7:1 motorized zoom lens auto-calibrates itself with every magnification change, over the life of the measurement system. The zoom lens keeps images in focus and on-axis throughout its zoom range, and a variety of optional lens attachments and adapter tubes expand the magnification range, for additional value and versatility. LED coaxial and profile illumination combine with the patented white-LED SmartRing™ programmable ring light to provide lighting for varying measurement conditions. SmartScope® ZIP Lite 300 also provides multisensor touch probe or DRS™ laser support. Illumination is provided by a range of programmable LED light sources including the patented 8 vector, 8 sector SmartRing™. This lighting combination, in conjunction with OGP’s advanced edge detection algorithms; ensure consistent feature recognition, guaranteeing accuracy, repeatability and reproducibility of measurement. 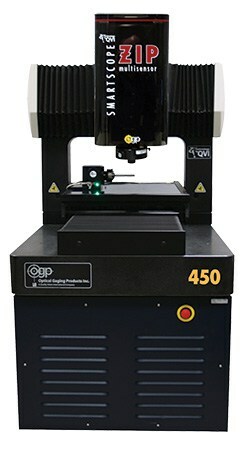 With OGP ZIP coordinate measuring machines users can add a combination of sensors such as the Renishaw touch probe, TTL Laser, low force Feather probe or Nanometre white light sensor, to provide complete versatility on a single machine. When using more than one of any of these sensors in your measurement process throughput, accuracy and speed of information significantly increases. OGP’s full multi-sensor capabilities are maximised with the integrated software packages, which support any application with ease.